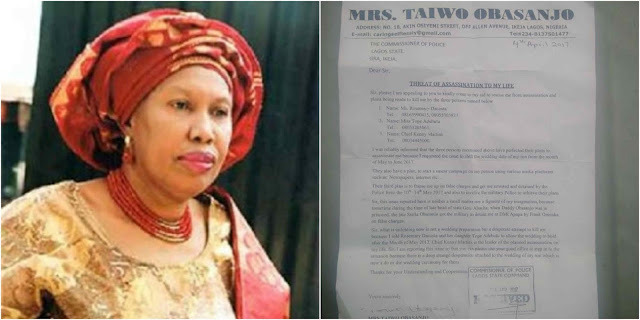 Wife of Former President Olusegun Obasanjo, Mrs Taiwo Obasanjo has alleged that certain persons have been detailed to assassinate her following a court action she filed last month to postpone her son’s wedding. In a petition to the Commissioners of Police, Lagos State, dated 4 April, 2017, Mrs Obasanjo alleged that those assigned to kill her include her twin brother, Chief Kenny Martins, her future daughter-in-law Tope Adebutu and future mother-in-law, Ms Rosemary Dacosta. Mrs Obasanjo further stated the trio have perfected plans to get the police to arrest and detain her on trump up charges between May 10 to 14, 2017 when the wedding is scheduled to take place.